An 82-acre tract in south central Colorado, near the New Mexico border, is the site for one of the largest photovoltaic power plants in the United States. New Mexico’s elected officials set a target of 100 percent carbon-free energy by 2045 in a bill introduced Thursday. The Energy Transition Act (SB 489), sponsored by Democratic Sens. Mimi Stewart and Jacob Candelaria and Rep. Nathan Small, adds to the Renewable Portfolio Standards already on the table. Gov. Michelle Lujan Grisham championed legislation introduced Feb. 1 that set a timeline for moving the state’s electricity supply from coal to solar, wind and geothermal power to 50 percent by 2030 and 80 percent by 2040. This bill lists those timelines as well, and sets the mark to 100 percent carbon-free power by 2045. It ranks among the fastest timelines in the nation, tying with California but mandating what that state set as an aspiration. 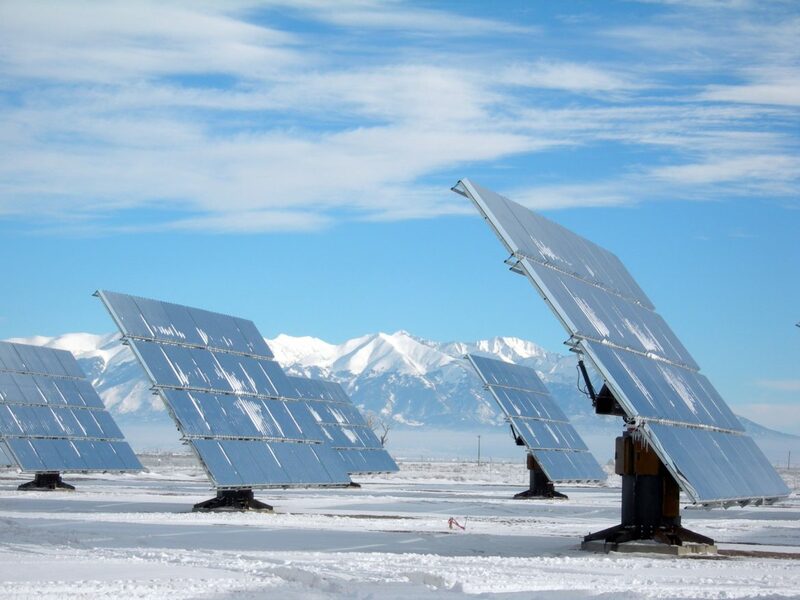 “We know New Mexico can be a leader in the transition from fossil fuels to renewable energy in order to combat climate change, so we made sure this bill, the Energy Transition Act, has strong protections for the environment, and challenged the utilities but is not impossible for them to achieve,” said Sanders Moore, with Environment New Mexico. The 100 percent carbon-free power applies to investor-owned utilities, including Public Service Company of New Mexico and El Paso Electric. Rural electric co-ops will also be required to provide 50 percent renewable energy by 2030, but get an extra 10 years to reach 80 percent renewable power by 2050 instead. Renewable power is defined in the bill as solar, wind and geothermal; hydropower facilities; fuel cells that don’t use fossil fuels; biomass facilities powered by agricultural or animal waste, small-diameter timber or salt cedar; and landfill gas. Nuclear energy is expressly excluded. The bill also sets carbon-free standards, leaving room for PNM to keep its contracts with Palo Verde Nuclear Generating Station, which expire beginning in 2046. Plus, the bill includes $20 million for severance and job training for coal plant and mine workers, and $20 million for economic development in San Juan County. “The big thing that happens in this bill and doesn’t happen anywhere else and cannot happen at the [utilities’ governing body, the Public Regulation Commission] is that there’s relief for workers and the county,” said Camilla Feibelman, director of the Sierra Club Rio Grande Chapter. Those measures, as well as efforts to create apprenticeships to build a local workforce, have prompted buy-in from groups like the International Brotherhood of Electrical Workers. “We hope we can transition that region to a cleaner energy future, but it may take some time to get folks there to accept the situation,” said Steven Michel, deputy director of the clean energy program of Western Resource Advocates. Part of what this legislation also attempts to do is cushion the blow for current employees. Westmoreland Coal Co., which owns the San Juan Mine, filed for Chapter 11 bankruptcy in October. The legislation didn’t receive a warm reception from Sen. Steven Neville, Republican of Aztec. The area is undergoing a painful transition, which Neville described Thursday. The local school district, Central Consolidated, could lose nearly half of its property tax base, Neville said, with the anticipated shuttering of the coal mine and the San Juan Generating station. “You lose 45 percent of your tax base overnight, that’s a problem,” he said. It’s conceivable the state of New Mexico would have to assume the cost of paying off the school district’s bonds. The loss of local tax revenue couldn’t keep up with bond payments, he explained. And whatever industry would step in to replace coal would likely create a fraction of the jobs currently associated with the mine and power plant. “We’re going to lose 1,500 jobs and they’re high-paying jobs,” he said. There is no provision in the bill to “replace those jobs” other than the job training money, Neville said. And even that’s not guaranteed to benefit the area. “They may get trained, but they may move out of the area,” Neville said. Lujan Grisham campaigned on accelerating the state’s shift to renewable energy. On Jan. 29, she signed an executive order committing the state to reducing greenhouse gas emissions to 45 percent below 2005 levels by 2030, as outlined in the Paris Agreement. This bill is part of that effort. Trip Jennings contributed to this report.